It comes down to a question of trust. There are things that we share and others that we keep a secret. And certainly in the blogging world it is an issue that pops up nearly every day. How much of me is going to go down on the page? How much of my life? Will Remi, my loving companion, be involved more than he prefer? Yes, there are certain issues that we have talked about since the beginning as being "no go zones" but otherwise, the choice is up to me. 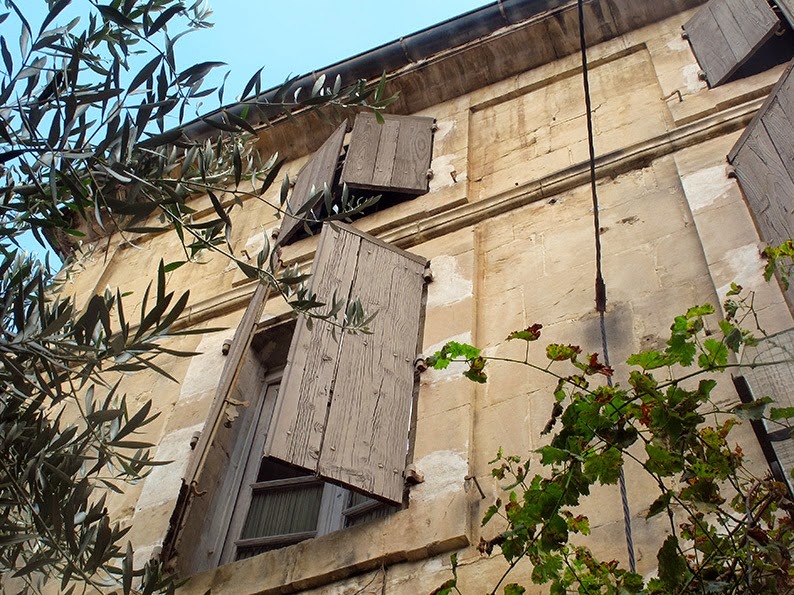 And so I was surprised to find myself hesitating - my fingers hovering over the keyboards yet not striking - when it came time to write a post about our new house. Especially as it is a lovely story, how we rented it. One day while walking the dogs, we came across a couple and Remi, ever the charmer, started a conversation. They were kind and invited us in to see their home once we had expressed interest in moving to such a wonderful little village. A few weeks later, we heard from them again. They knew of a house, something quite special that would soon be available to rent. It was never put on the market but rather passed off between friends or friends of friends and would we be interested? We would. The first time that we walked up to the address, Remi and I looked at each other in disbelief. The house...was...is...so beautiful. All during the visit, my hands were shaking with excitement. I have the blurry photos to prove it. And those same photos would be all that we had to go upon in the weeks and then months that passed while we meet the owner, got her approval and then set the moving date. It all seemed too good to be true. 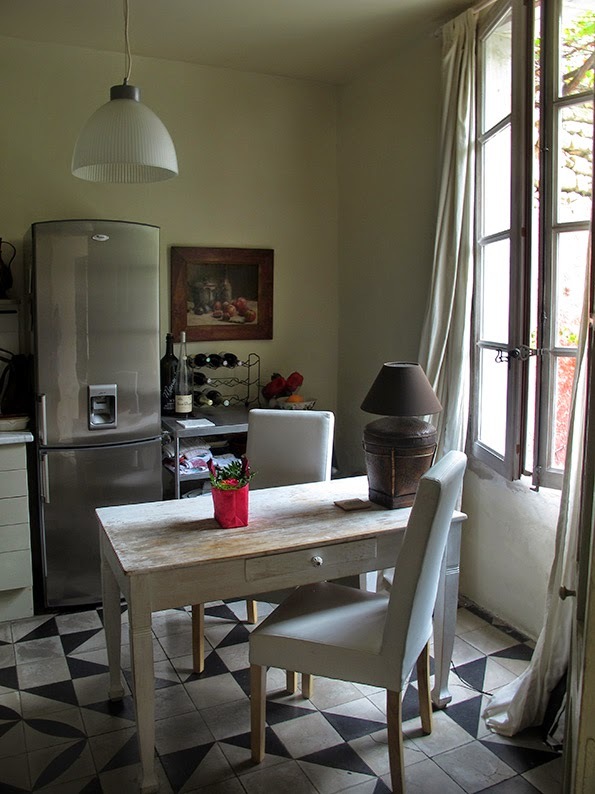 The rental of the house is the same price as our previous apartment in Arles! We picked up the keys on July 8th and Remi started to work. 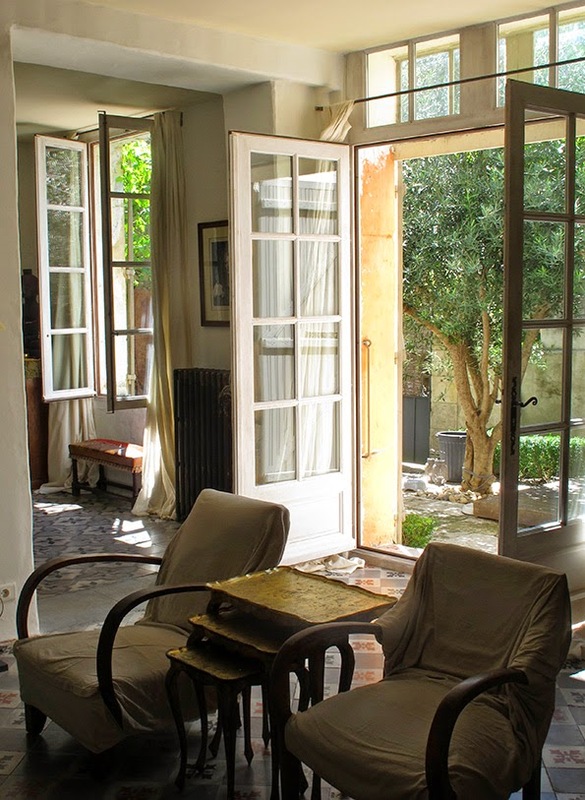 He repainted nearly all of the rooms in this three story house, sanded the parquet floors where needed and started gardening in the courtyard. When the 21st rolled around, we were relieved as it was finally happening! The following weeks have been spent slowly emerging from the sea of boxes. We have taken our time and there are still things to be done, which feels right. In the evenings, we walk around with a glass of wine in hand to visit the house, to take it in, for we still can't believe our luck. It is so very peaceful here. So why the hesitation in sharing this gift from Life? I think a part of me is still having a hard time knowing that this can last (even though that is a big part of what I am working on this year) and for the other part? Well, it feels...important...for us to be here and that is precious and to be protected. Plus, to top it off, will it sound like I am bragging? Ai! 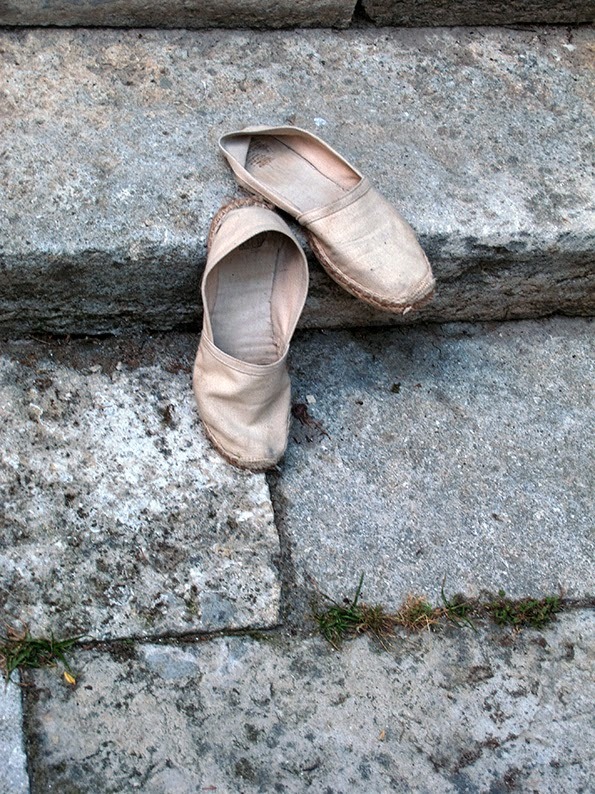 That goes against everything that Lost in Arles is all about! Remi and I are both clear that we don't own this fabulous place but are just taking care of it, so I dearly hope not. Nearly half of the walled in courtyard is covered with a trellis that is topped by an enormous old vine. I will tell you about going through our first vendange soon but all summer long we ate under tumbling grapes! We think that the core of the house dates to the 18th century. It can be hard to tell in places but that is what we are guessing in looking at the classic facade and windows. ...as does a mini cabanon that we will repaint. It will be the perfect spot for a post-lunch siesta. We are using a trunk bought years ago at a Paris brocante - one inscribed with Remi's initials in an iron flourish - to store the garden tools. ...texture and time coming together to make something beautiful. It is a wonderful reminder of how many families have passed here before us. Just inside of our front gate we have a lovely example of la calade. This once typically Provençal mosaic of galets is becoming increasingly hard to find. 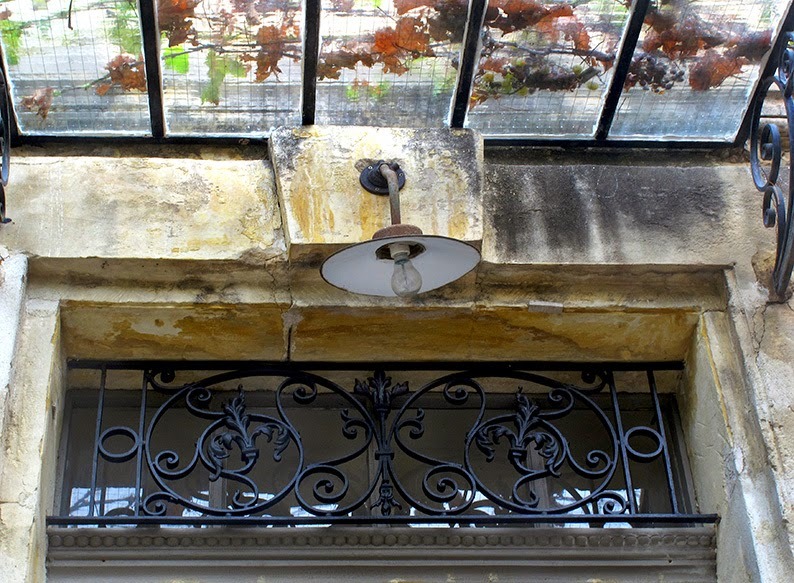 ...and over the front door there is a rather surprising combination of ironwork stamped with fleurs de lys and a farm lamp that has seen many a year pass already. Something tells me these two weren't always together...but then again, such a mix of formal and casual is a lot of what this house is about. 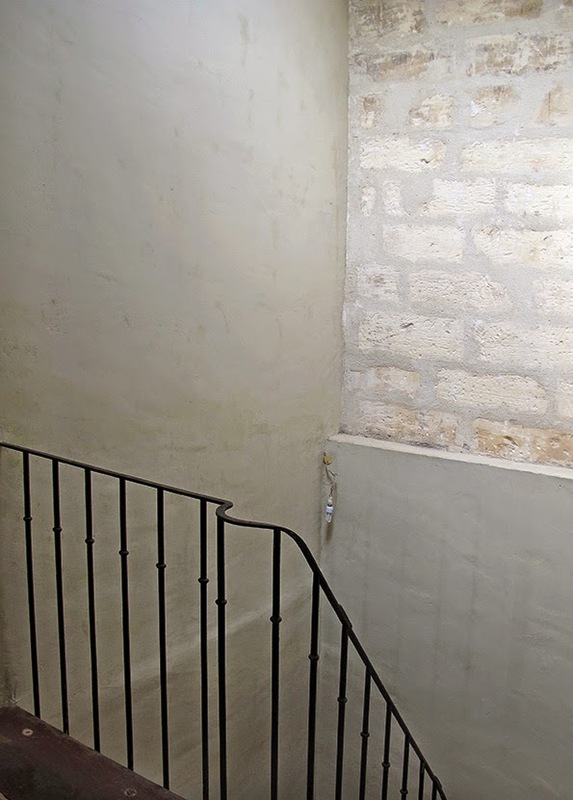 The entry has a floating staircase that made an architect friend start with surprise. 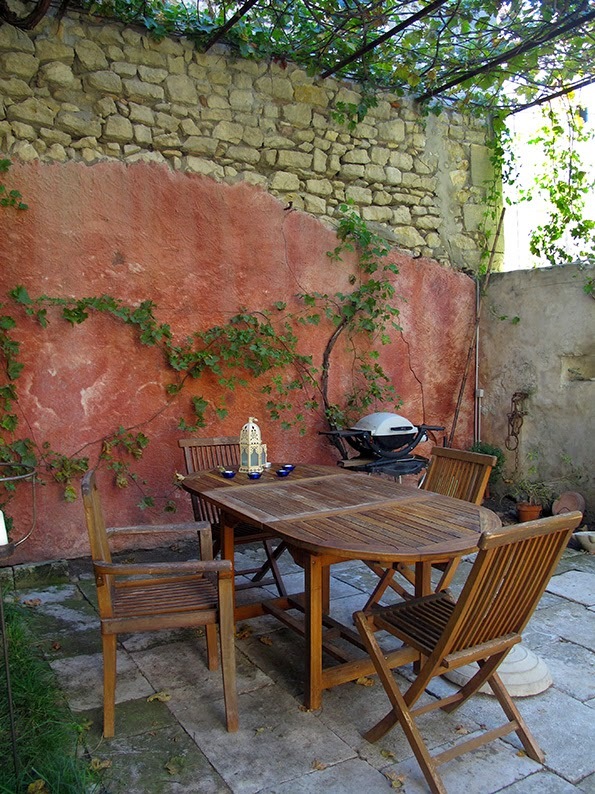 Those dark grey slabs are not concrete but a stone that is new to me, la pierre de Beaucaire. For the ground floor rooms on the right, we made two decisions. One, we wanted to bring in the light. Even though the house is south-facing, which is beyond wonderful, we knew that it would need all the help it could get during the winter. We have never used off-white in our other houses but here? 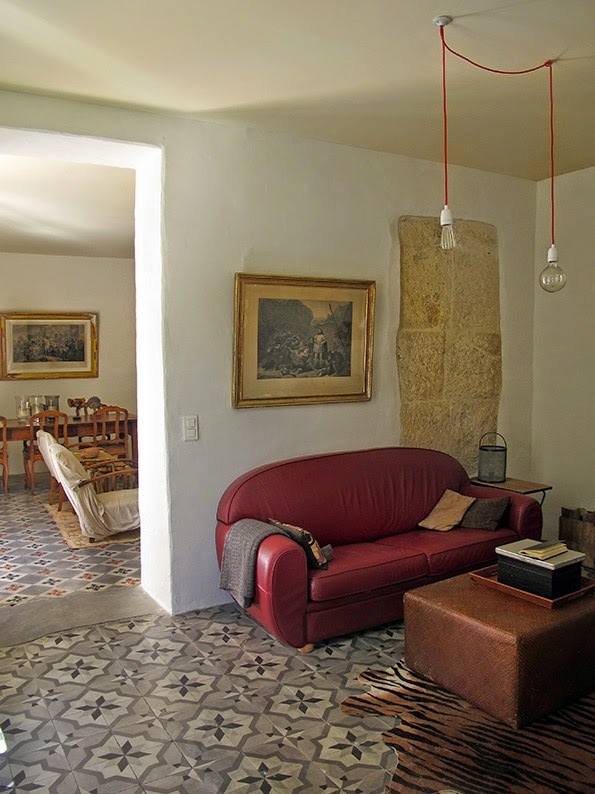 It absolutely makes sense, certainly as we hoped to set off the cement floor tiles dating from the beginning of the last century in a simple, clean manner. All of our Persian rugs are rolled up in the attic. They just don't work with the color schemes or feel of the rooms. And I have to give Remi credit for the second idea. The smaller room had been clearly destined to be a dining area. But as A) the sole working fireplace is there, B) we love to have a fire every night that we possibly can and C) we would love to watch movies in front of the firelight, then why not make this into a small sitting room instead? 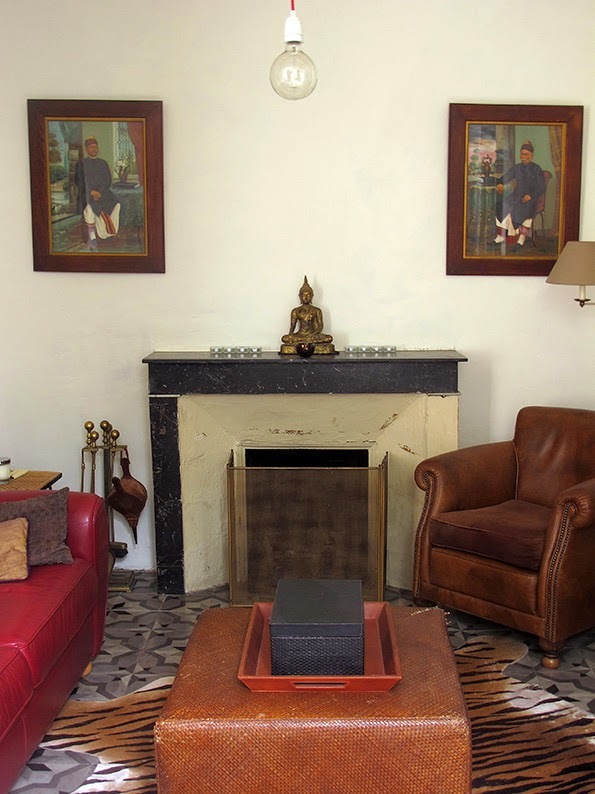 That set-up - minus the working fireplace - served us very well at our previous apartment so I will just have to put away my grand idea of a cosy formal dining room - and I don't even like formal dining rooms! - for now. 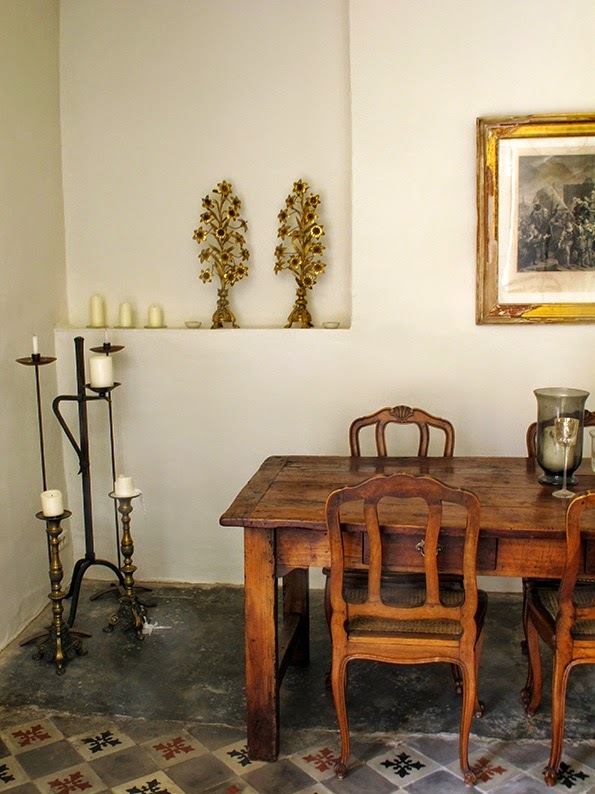 Besides, happily there is room for our monastery table in the main salon. In theory, this space would be used more for entertaining but it has quickly become my second favorite room in the house. And yes, there is a rug that works here. 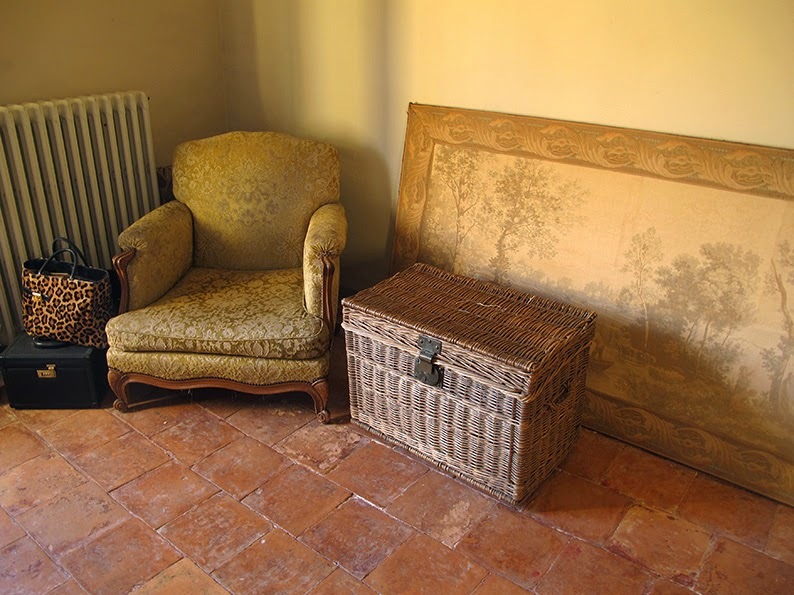 It is an antique Provençal woven rattan rug that we found and saved from being thrown out at our last apartment. The workmanship is amazing. 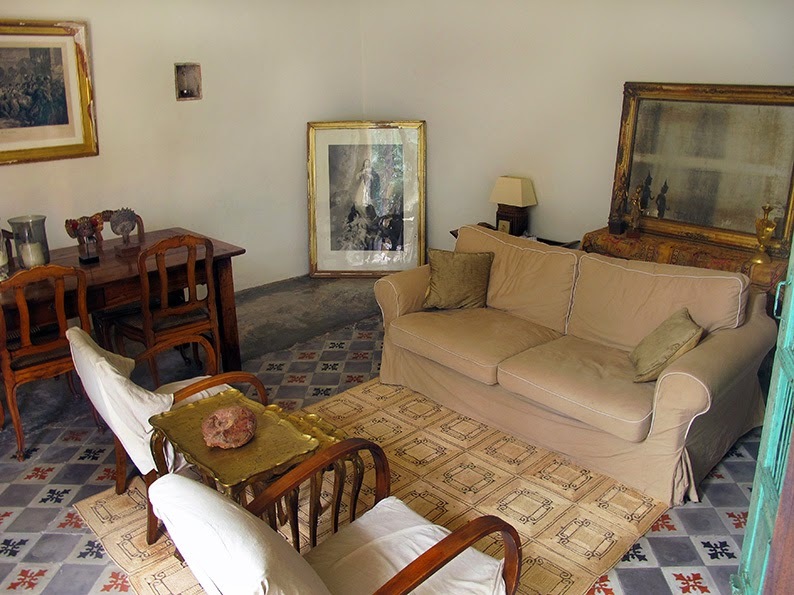 In the far corner, la Vierge Marie (she is an antique lithograph of the original in the Louvre) is holding the place where a wood-burning stove will be installed when we can afford it, probably next year. The cost of installing the stove will definitely be worth it as it will offset our heating bills enormously. I find myself wandering into this room whenever I need to breathe a bit. 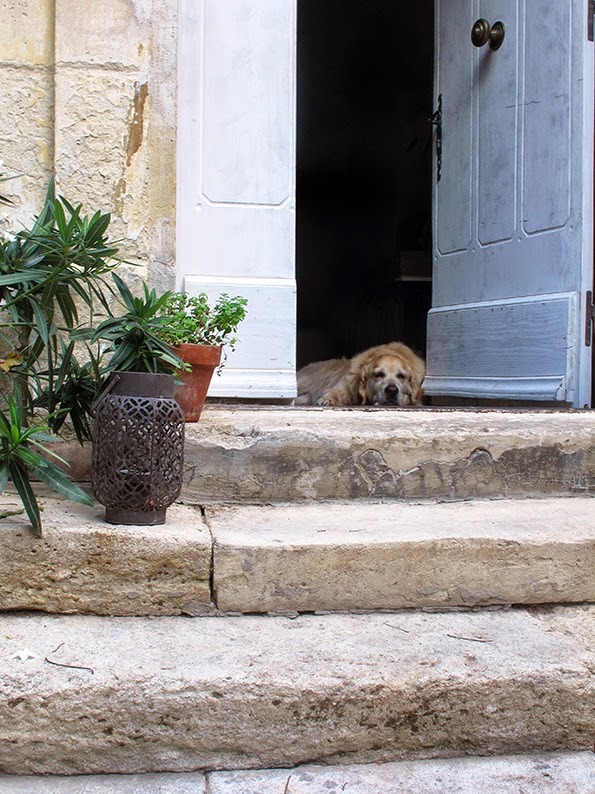 In the heat of this past summer, I would love to lay on the couch for la sieste in the afternoon - sometimes Ben or Kipling would join me - and look out onto all of that green. And yet I feel perfectly protected. No prying eyes can follow me here. We nearly always have some sort of music playing in the house and the stereo is also here, tucked away in the green Indian cabinet. Needless to say that in the evenings, this room is a Bougie Bonanza! 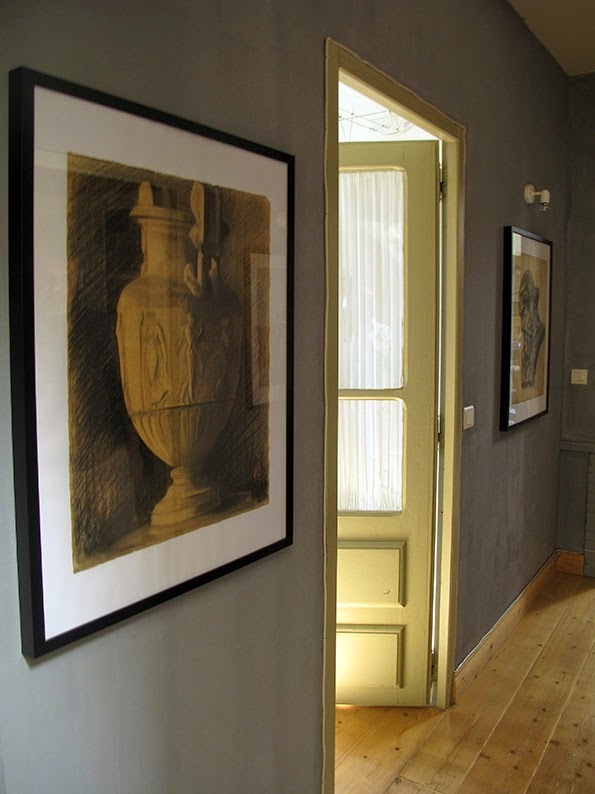 The flames from the candles flicker in the wavering glass of the lithographs and the glazed mirror. Up goes the music and...magic! Big enough to dance in. Yep, the marble countertops, vintage crackled back-splash and amazing floor tiles (from a former ballroom) are nice and all, but let's get our priorities straight here, shall we? Allez, hop! 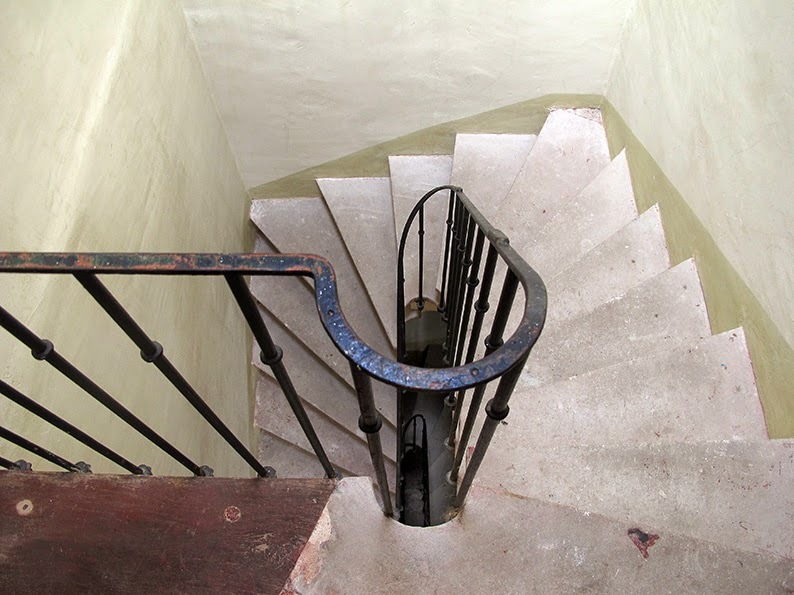 Up to the first floor. 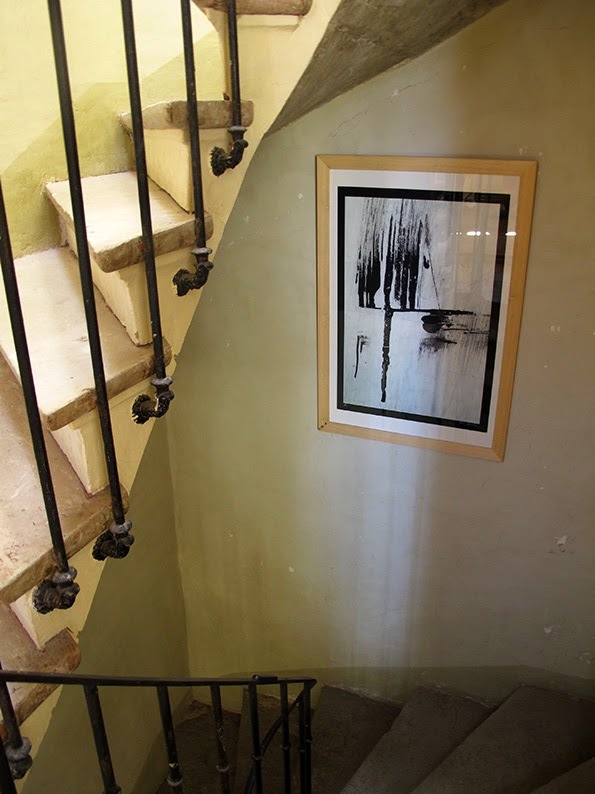 That is one of Remi's abstract photographs in the stairwell (What? Me? Copy him? How dare you!). Wherever we could, we have tried to balance out the old with the new. 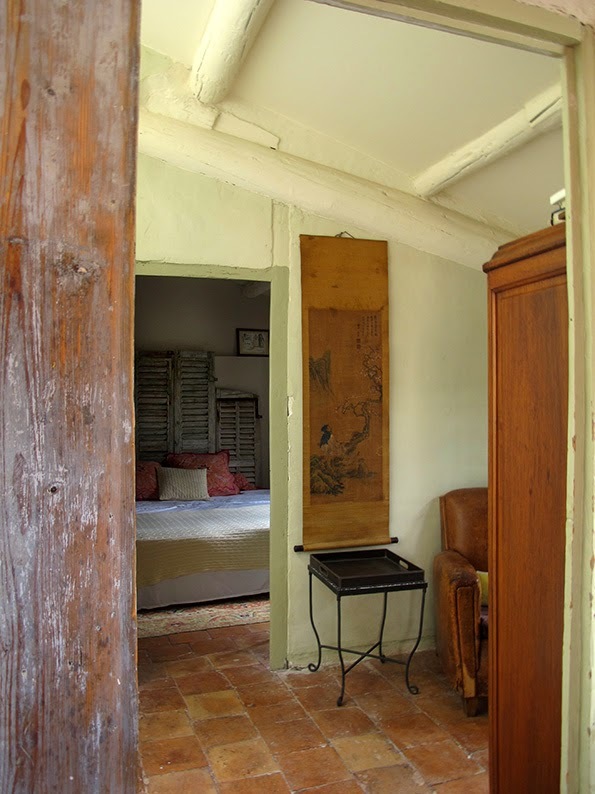 In no way do either of us want this to be a "Welcome to the Charming Yee Olde Provencey House." And you know what? The house doesn't want that either. Now here is something interesting. That's our bedroom. Shhhh...the key word here is quiet. We have made a deal that there is nothing in there to make extra noise. No dirty clothes at the end of the day, no electronics, just a book on the bedside table. And as someone who has suffered from chronic insomnia for over twenty years I ask you, "Why has no one mentioned this before?" It works. We sleep like happy kittens. Up one more flight...can you feel your calves getting stronger yet? I can. ...but it is still a work in progress. While Remi fixed the hole in the roof for the floor below (it was literally raining inside on the day after our move! ), we will have to call in a roofer for the rest, so I still haven't hung up a lot of things (although my little Art Shelf will most likely stay as it is), so more of that room later on. But trust me, everyone loves it and wants to spend time here, which is nice. It isn't just me. Look at the view from my desk! My unbelievably patina-ed door opens out on to a palier that we have designated as Remi's reading area (the bookshelf that you can't see is full of photography and art books) and then towards our guest room (with its own bath - may I say again: finally! Hooray!). We have already welcomed friends and family and my room can be used as well if there are children staying over as there is something of a princess bed (ah-hem) going on. But, again, there is still much to be done. Happily. 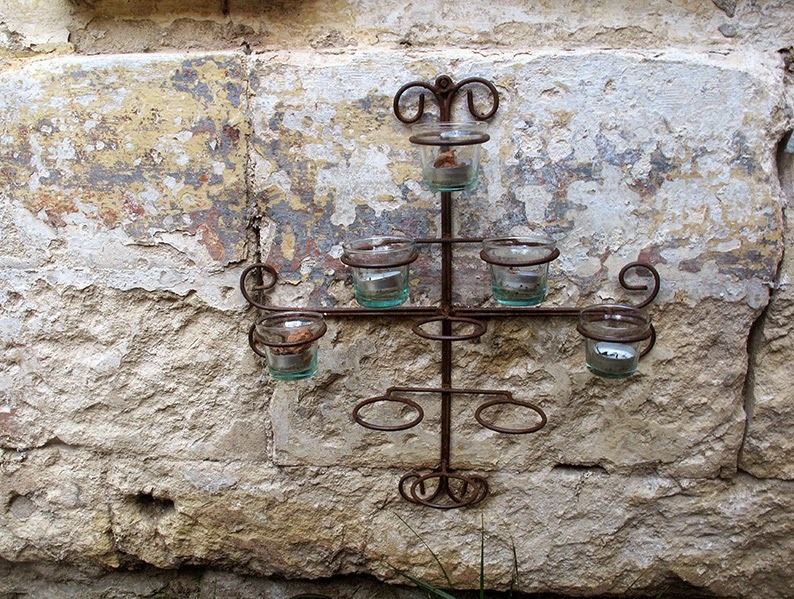 Although I think I am going to end up making the light fixtures for the hall if I can't find what I want soon! 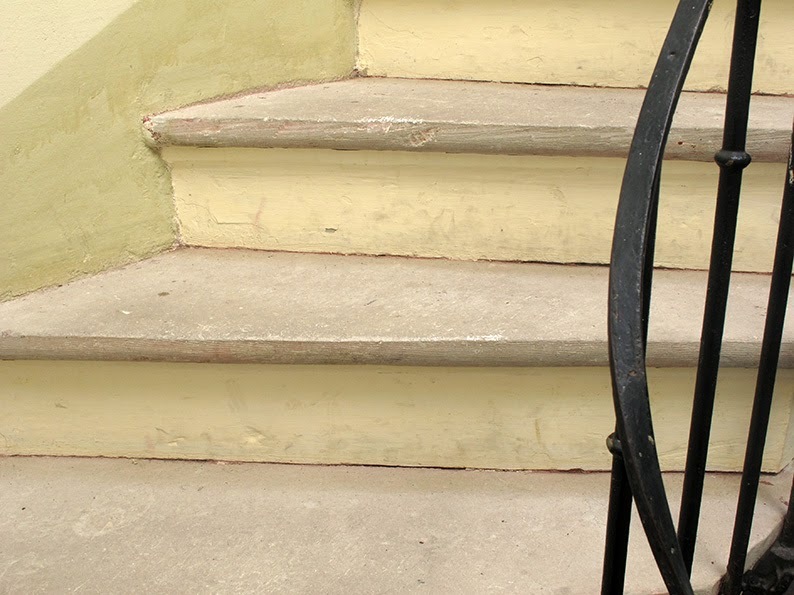 Yes, I do like to sit on those stairs and dream and peep, down, down, down all the way to the bottom. Remi and I also like to communicate via this central stairwell too. So much of this house just makes sense to us. ...we have made ourselves at Home. So there you have it! 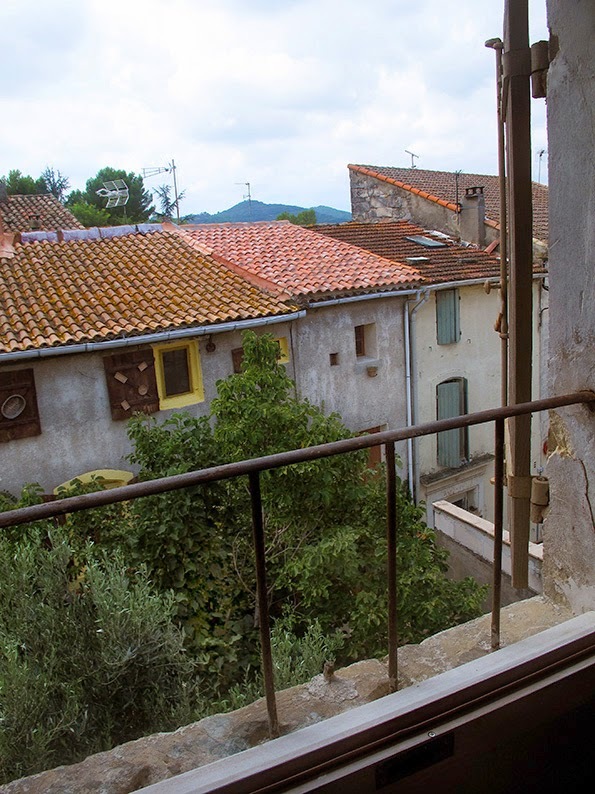 In the nearly four years of Lost in Arles, I have never put so much into preparing a post. I know that some of you have been waiting a long time for this, so thank you for your patience as well as respecting my choice to not name the village that we have moved to - which is a matter of privacy as well as, let's face it, security. That too is a matter of trust and with all of my wonderful friends here, I know that I am in good hands. Today's post is part of the International Blog group, "By Invitation Only" and the theme for this month is "sharing." To see what the other incredibly talented women have to say on this subject, please join the party by clicking: here at Splenderosa. Bien venu in your new home! Looks very charming. 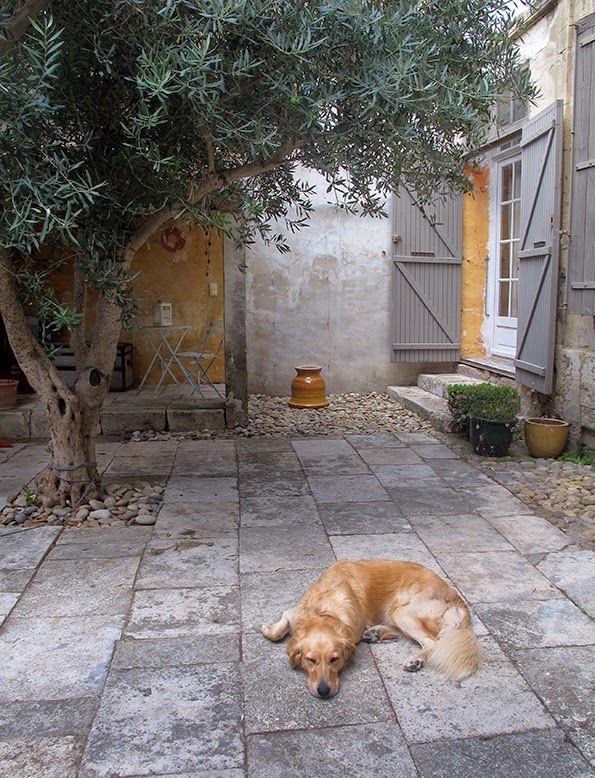 But - for me the most; most attractive "feature" is that olive tree in the courtyard!!! My dream! I ENVY you! WEEEE..........is SUNDAY too soon!I arrive at 10:45 am.......in PARIS! You do?! But I won't be home yet!!! Air France is on strike and so I have to wait for my flight back! How long are you staying??? 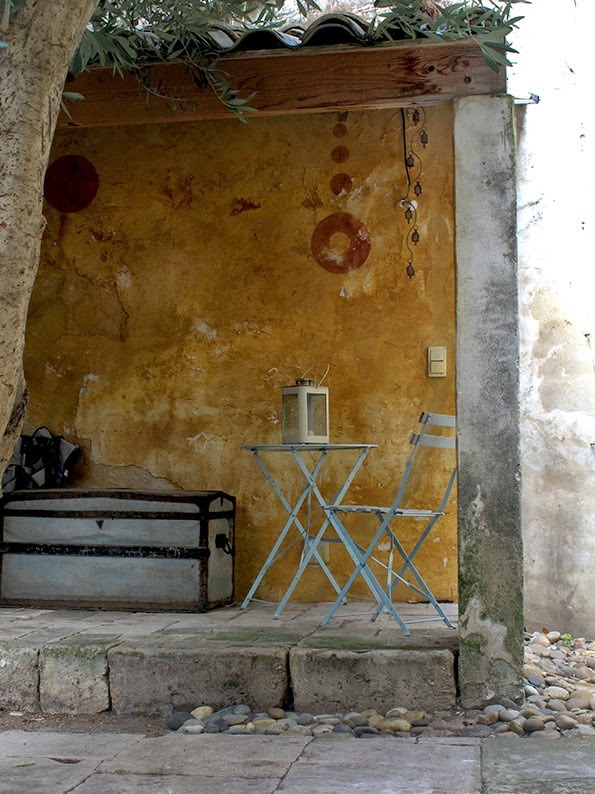 (such a peaceful place to make a Siesta) give this house a special charm. It's wonderful and reflected your personality. I wish you both a very happy time in your new home. I am sure you have the bruises from pinching yourself,but do not worry about whether it will last; instead enjoy the Now and what is...because it IS FANTASTIC! Congrats to you all! May you love well there! Trudye that is sound advice and yes, the photos of the pups were specifically for you! It's so simple and old and beautiful. I am so happy for you. It reminds me of some of the old houses we have here. Thanks so much for sharing. Oh ... I love your little room. It is perfect for dreaming and writing. A post like this takes enormous courage. You send out something of such delicate intimacy and the hope is for a ping! back that makes the vulnerability worthwhile. May you have those pings in lovely succession as your friends enjoy the tour of your charming new home. There is a wonderful spirit, here. Blessings on your threshold with every eye that passes over what you have created for us today, Heather. I wish you all the joy in the world in this fabulous home. It is so beautiful, I can hear the silence. How lovely to be invited into your home. You have searched & waited a long time, but it looks like your dream has come true. 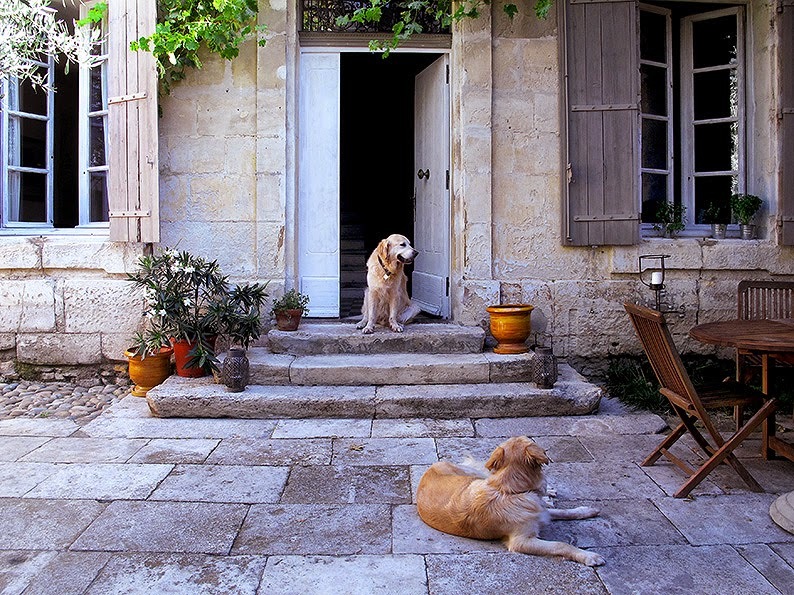 I can see many a glass of wine shared with friends in that beautiful courtyard, and mugs of hot chocolate in the winter warming your hands while you drink in the fantastic atmosphere created by you and your lovely Remi and of course your faithful dogs, who look like they've died on gone to heaven. Lovely post. Thank you for sharing your home with us. That takes courage and trust. 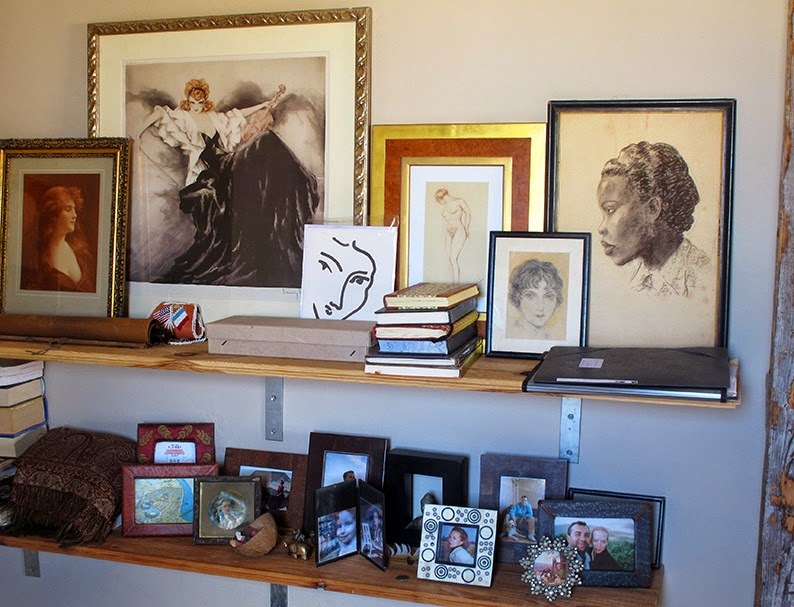 It's a beautiful space with which you are creating a home as you paint and potter, rearrange and arrange again. I'm so very happy for you. Oh my gosh Heather - it's absolutely the most beautiful home I think I've ever seen! It's perfect. So much personality, so much beauty, so humble yet so breathtaking. It just looks like a true "home" in every sense of the word. Love, love, love your home. It's so exciting to see what you've done to the place. Absolutely gorgeous! Thank you for sharing - you are living in my kind of heaven!! Are you up to sharing what town you live in, or maybe that is something that is a private thing. No worries, just love thinking about various towns we've visited and how lovely is that whole area. It's nice to 'place people' sometimes. What a beautiful home you are making - and the puppers are all done with their decorating - happy as clams! You know that my life is far from perfect George! But the bones are good. :) And look who is talking! What a lovely post! I love everything about your new home! You are blessed. I love the patina everywhere too, and the view from your desk. SIGH! Drool worthy and so very beautiful! The character and patina is wonderful. I love it all! Thank you for opening your doors and sharing your stunning home with us! Oh, it's absolutely divine!! What a lovely place to call home. Thank you for sharing it with us. I am sure that you will be more than happy in your lovely new home. It looks wonderful. a home and contented hearts. Thank you for my poem, Edgar. Oh Heather! It was worth the wait. I am just thrilled to my very toes for you. Thank you so very much for sharing your beautiful new home with us. I agree, it feels like it's important that you are there, and whether you remain for a few months or a few (or many) years, I sense it serves some deeper purpose in your life. How marvelously marvelous. All that patina. And a room of your own. Welcome home! This is an astonishingly lovely home Heather, and so wonderful to see that you have made it yours (as well as its own!) in such a short amount of time. In fact, it's so quick it's making me dizzy. The light, the stone, the textures and the aged life within it are all shining - what a gloriously lucky turn of events to be able to call it home. I am thrilled that you have found this beautiful home and are making it your own. Somewhere there is always a place with our name written on it. :) Thank you for trusting us with your precious private space. The puppers express the contentment that you all feel. Merci Sue. Yep the bones are amazing! Glad you like it. Wow, what a find! But the house is lucky too, to have tenants with taste and appreciation. Thank you for inviting us in and showing us around. Merci Leslie, I was so, so happy to see a photo of Henry and Bon on Judith's instagram page!!! Can you believe this? Is it really that one has to risque everything to gain everything? Is it that one has to grasp for the stars to be able to pick one in the end? Because thats what this house is – a star and a jewel that you were rewarded with. If I think about the story how you found this house- unbelievable! 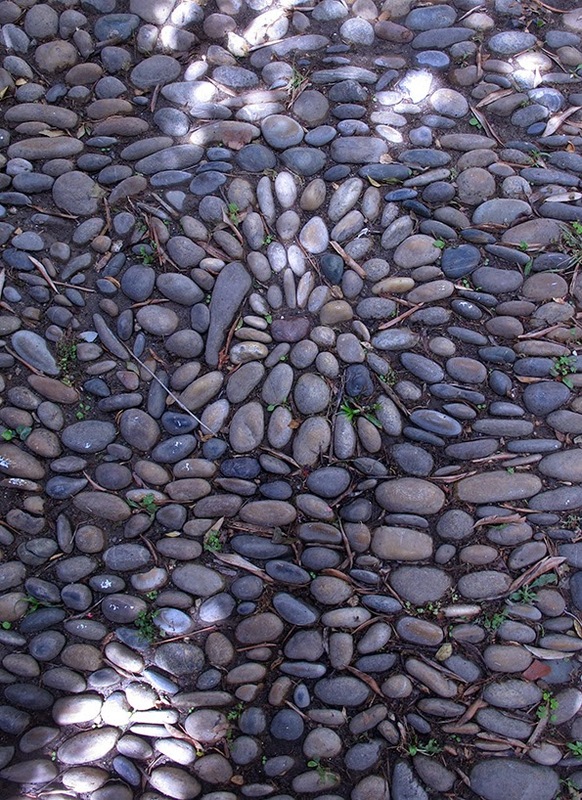 Someone who gets rid of the concrete to install antique floor plates in the courtyard and in the end gives the house to someone else to take care of who understands and appreciates this so much like you do – thats a beautiful story! And forget about the bragging. We all know you are not of that kind and we all enjoy your images and to know that life still holds certain miracles. Though I must admit it "hurts" nearly physically to see all that, if you knew what you can get aroundhere (; But I am very, very happy for you!!! Love everything, the kitchen to dance in, the kitchentable, the lightbulb construction in the fireplace living room, the wonderful view from the "room of one's own"(remember that essay by virginia wolf?) and your furry boys spread everywhere on the floor!!! Silke, why do you live so near yet so far away? That is all I have to say. Great place!! May you have many years of dancing in the kitchen! Long contended sigh, this feels like home. How beautiful, and thank you for giving us this glimpse of architectural spirit — kind of divine! OMG, I am overwhelmed with joy to know that you found the perfect place for both of you guys and the 2 doggies. They look so happy to have a courtyard in which to soak up the sun. This place is brilliant, Heather !! Your post is beautiful and heartfelt. This is SHARING X10!! Thank you so much for being part of our splendid group, "By Invitation Only." You have made my day !! It is such a radical change from living in the heart of Arles on a street that was busy from 4:30am (the bakery) to 2:30am (the bars getting out). I especially see a huge difference in Ben! Thrilled for you both... And the pooches. And thank you for sharing your new home with us! A belated Welcome Home! Wishing you and yours all the best for many years to come in your 'patinaed' ( made up word) new/old home...ENJOY! What a lucky find. I'd never leave the courtyard! 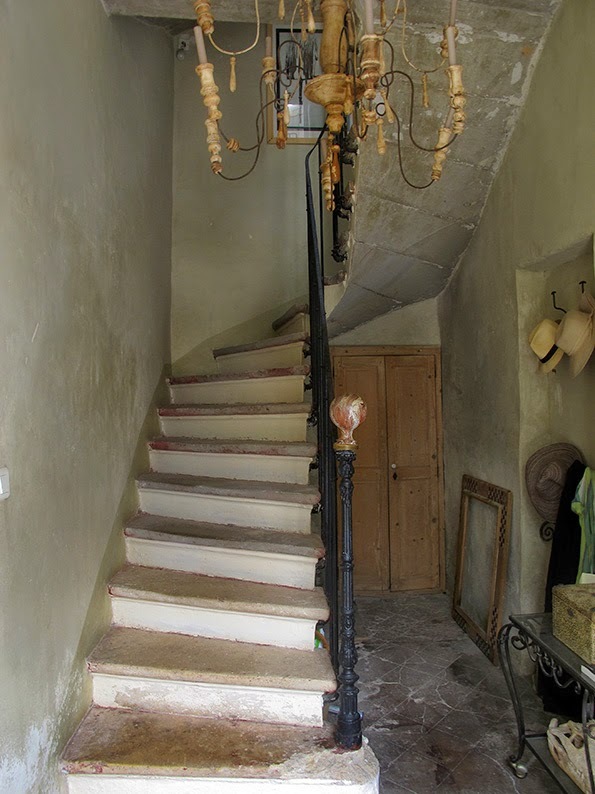 The staircase is amazing, the rooms and light perfect. Just perfect. Good things happen to good people. What a beautiful house and what beautiful surroundings! Ben and Kipling look like they are very happy in their new digs. That is a lovely thing to say...thank you Gina! Heather, a little bit late but I read this beautiful post just now. I hope not to be late to wish you a wonderful stay in this lovely home... yes because I strongly feel that you and your partner made this house into a really warm home. Everything is stunning there and the room I liked the most is " yours own". The surrounding atmosphere is similar to the place I live so I can understand your feelings. ENJOY YOUR NEW HOME MY DEAR. Gretel, that is just the most fantastic image!! I already am late for thanking you for your very kind message for my Mom and Leonard, so please accept my apologies (*little curtsy*) as I thank you doubly here. 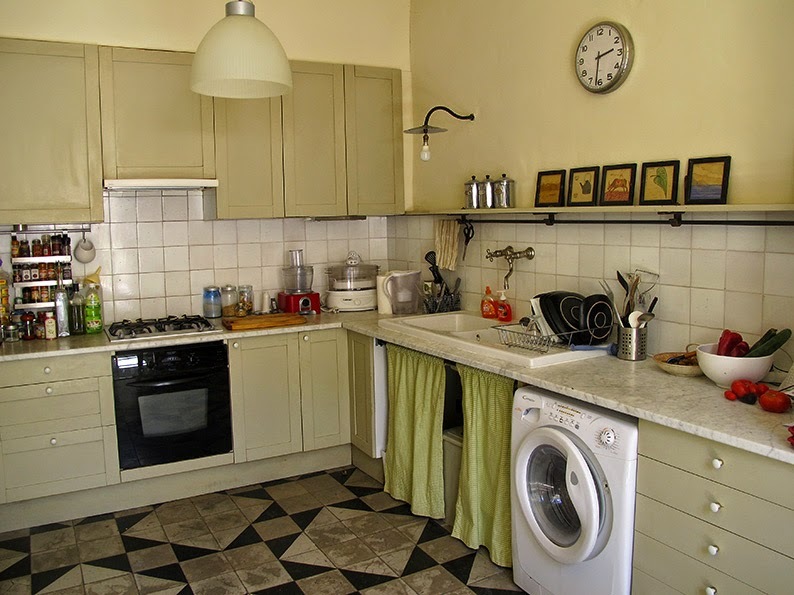 I've enjoyed your home search almost as much as I enjoyed ours in Greece. I am so glad you found the perfect place. . .and it really does look perfect. Thank you for inviting us on a tour. I understand about revealing too much of one's life in a blog. . .those are the most difficult of posts to write - you did this one beautifully. What a wonderful place! Not just a dream come true but heaven! 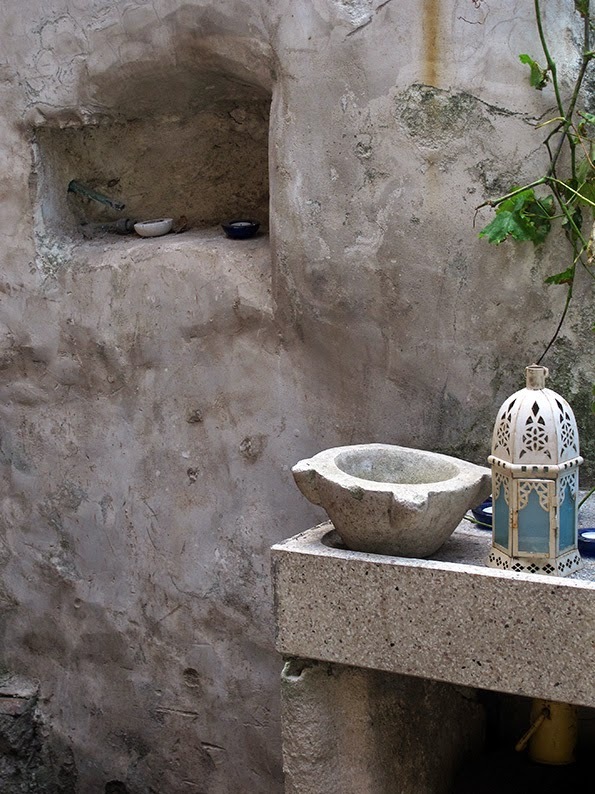 And I just love the way you are decorating it, both indoors and in the courtyard. She was so lucky to find you two, or four, to take care of such a precious place. Thank you Teresa Maria. We do feel that the house is happy to have us...but she also was happy with the previous renters as they had two young girls and the house was filled with energy and play! You are so wonderful, Joan. Thank you. Your home and all the marvelous touches of your personalities has given the house a heart and soul. Two bathrooms is perfect. You have a room of your own, how wonderful. It is a great feeling. I can see why you are both so happy to call this home and may there be happiness, peace and joy always with you. Thank you so much, Helen! What beautiful house-warming wishes. Exquisite! It is a relief to think of you in a beautiful space with room to breathe, create, thrive! 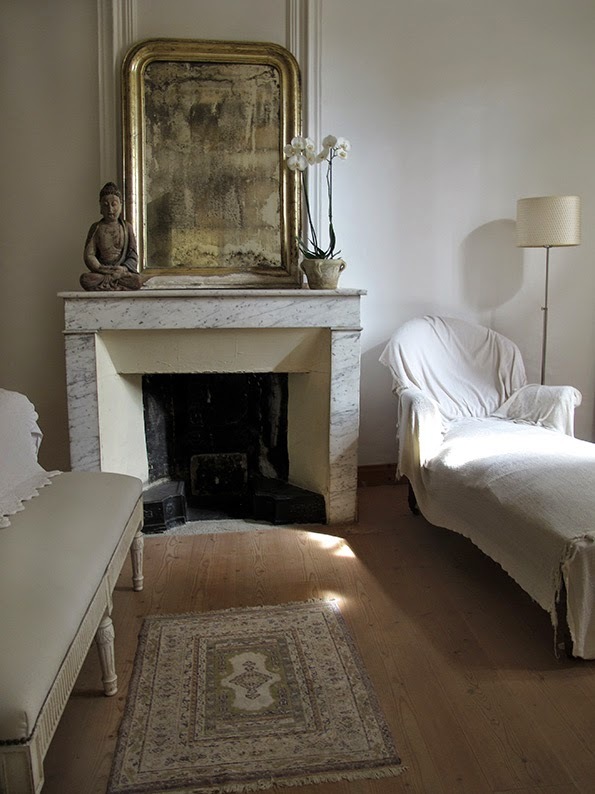 When you wrote a while back about the Huissier de Justice and the notice to move from your last apartment in Arles my heart ached with sympathy...moving can be such a tremendous challenge; but this move looks like it is fitting so well with your life and a mirror to your inner beauty. May there be profound happiness and continued thriving to you and Remi and all your dears! Aurelia, you have such a way with words...and compliments. Thank you so much for your generosity and warmth of spirit. They both are truly appreciated. Absolutely charming. Did I miss where it is in Provence? We are well into March 2015...it is 3am in Montreal...and I have just read your delightful post. Oh, what a lovely home, what a charming lifestyle and what wonderful prose. Thank you Heather..your words and photos make my heart sing with the joy you so generously share...I wish you all that you wish for yourselves...and then some. I was giddy for you reading through this post. I love your home. I am excitedly living vicariously through you. The way that you explained every room made me feel as if I had just walked in and seen every square inch of your home. Thank you for choosing to share this. It's beautiful and gives people like me hope, that someday I too, will have my dream home - a home that will speak through the walls to me. A home that has history and life and amazing unique character....just like yours. I do agree with all of the ideas you've presented to your post.